San Marcos Yoga is set up to provide you with a great way to learn yoga. We provide all the yoga equipment you will need. Our yoga studio is a beautiful, simple space to take class. We are a small personal yoga center, and we value each and every student. Our students are all ages, sizes, genders and ability levels. You will feel welcome. We offer several ways to get started. If you have little or no yoga experience, our Intro/Level 1 classes are suitable for beginners. If you have some experience with yoga or have been practicing for a while, we are happy to offer you individualized advice to help you decide what class level is right for you. Give us a call at 760-533-9713 or email us with your questions. 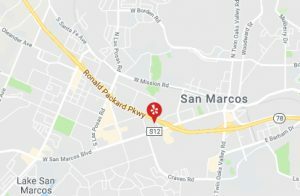 If you are new to San Marcos Yoga classes, please arrive 15 minutes early to your first class for a bit of paperwork. Iyengar yoga is practiced without shoes so prepare to be barefoot. Wear comfortable, non-binding clothing – best if the teacher can see how you are standing and moving, so leggings/capris are a good choice. We provide very high-quality mats, blankets, straps and blocks to help students get the most out of their practice. (Feel free to bring your own mat if you like.) Precise words, props, and teacher demonstrations help facilitate learning for people of all ages and physical abilities. Do I need to be flexible to start classes? Absolutely not! One good thing about yoga: it helps you develop flexibility. We work with “your body today” – students of all ability levels are gently challenged. Do you only work on flexibility? Increased flexibility is only one of the benefits you can receive through yoga practice. Yoga also improves balance, builds strength and promotes confidence! We welcome new students to San Marcos Yoga classes at any time. You can join a Level 1 class at any time- there are no ’start and stop’ dates. Each class is different, so you are always learning something new along with reinforcing the basic practice. You have the same teacher every week, so that your teacher gets to know you and your body. This enhances your learning experience. Attending classes at least once a week is the best way to learn yoga. The benefits you feel are more evident with more regular practice. Therefore, more that one class a week can be extremely beneficial, as well as a regular home practice. Yoga can be a daily practice, and some of our students practice at home as well as in class. We teach Iyengar Yoga, which focuses on the body’s natural alignment to promote healthy joints, bones and muscles. Iyengar Yoga also uses “props” so that every student can work on every pose at their own capacity. Iyengar Yoga also teaches concentration and focus as well as relaxation. 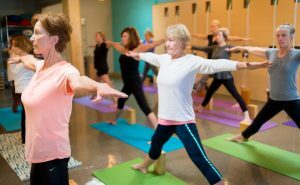 Finally, Iyengar Yoga teachers are trained in the art of sequencing – classes are structured to maximize your learning and understanding in a sequence of poses that warms you up, and then cools you down. To be effective teachers, yoga teachers need to have their own personal practice, as well as continuing training from senior teachers. 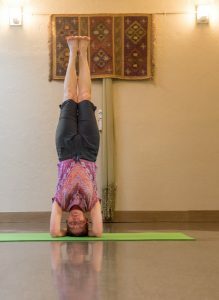 San Marcos Yoga teachers are all highly trained in the Iyengar Yoga tradition and are required to continue their professional education with regular classes and workshops. This ensures you a safe class and the most recent, effective teaching techniques. Our teachers are supportive and our environment is safe and welcoming. New students can start with our Level 1 classes which are geared for beginning students. Call or email for more details or come to the studio 15 minutes before class time and we’ll help you get started. Because we are a small yoga center, we do not have office staff available at all times. You are important to us, so please call us or email and we will be sure to connect with you.